Since 2016, public entities have had to reveal the businesses they have large contracts with. These "1295 disclosures" reveal numerous legislators among the contractors — and some of those lawmakers have sponsored or voted on bills that help those same public entities. Clockwise, from top left: State Sen. Royce West, D-Dallas, state Reps. Jim Murphy, R-Houston, Eddie Lucio III, D-Brownsville, Lyle Larson, R-San Antonio, Ana Hernandez, D-Houston, Eric Johnson, D-Dallas, Justin Rodriguez, D-San Antonio, Sergio Muñoz Jr., D-Palmview, Joe Deshotel, D-Beaumont and Cecil Bell, Jr., R-Magnolia. Editor's note: This is the first of two stories on potential conflicts of interest involving lawmakers with business ties to public entities. Like most higher education institutions, Houston Community College officials had a lot they wanted state legislators to do for them in Austin earlier this year. The school found a champion in a veteran Democratic senator from Dallas. Sen. Royce West, who sits on both the higher education and finance committees, came through big for HCC and other community colleges, shepherding dual-credit legislation — which an HCC administrator called a “high-priority opportunity” — through a committee, the floor of the Texas Senate and onto the desk of Republican Gov. Greg Abbott. Weeks before West helped House Bill 1638, which strengthened connections between community colleges and four-year universities, pass the Senate, HCC gave his law firm, West & Associates, a place in its legal services pool — a list of pre-approved attorneys HCC chooses from when it has legal needs. During the legislative session, HCC also selected the law practice of Rep. Ana Hernandez, D-Houston, for its legal services pool, despite ranking Soto Hernandez 17th out of 20 bidders based on criteria including qualifications and experience. Two months earlier, Hernandez had filed House Bill 254 to help standardize the course numbering system used in public colleges — a proposal HCC administrators called a “key bill” during the legislative session. It’s not clear whether HCC has used West's or Hernandez’s firms for legal services yet. “It goes without saying that state legislators occupy a privileged position, compared to rivals who do not occupy the same position, because they can influence legislation that directly affects these public entities,” Jones said. Both West and Hernandez said they did not consider their relationship with HCC to be a conflict of interest. 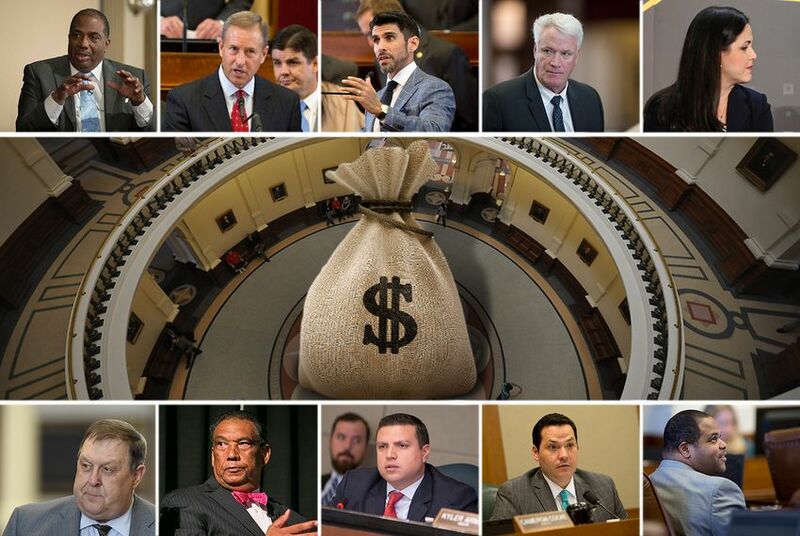 In Texas, lawmakers earn just $7,200 per year as part-time public servants. They all have regular jobs — many are lawyers or doctors or consultants. And some of them have business relationships with public entities — such as community colleges, utility districts and housing authorities — that depend on the Legislature to approve their budgets, decide how much taxpayer money they receive and pass the laws that regulate their operations. Some of those entities owe their very existence to the Legislature. Under state ethics laws, such apparent conflicts of interest aren’t prohibited. Lawmakers are banned from doing business with the state or counties — but only when that business relationship is specifically approved by legislation while they’re serving at the Capitol. But that doesn’t cover thousands of other public entities like community colleges — which means it’s perfectly legal for West and Hernandez to earn money doing legal work for HCC after promoting bills that would help the school. Until recently, such financial disclosures were largely hidden from voters — available only if you waded through the records of thousands of public entities. But in 2015, Rep. Giovanni Capriglione, R-Southlake, introduced House Bill 1295, which for the first time shed light on financial deals between public entities like HCC and businesses they contract with, which required those businesses to reveal who controls them — as well as anyone they hire to hammer out deals with public entities. At the time, Capriglione said HB 1295 was designed to ensure the public could discover whether legislators have conflicts of interest that voters should know about. “Just tell us who is making the money,” he said. Since the bill was signed by Abbott, the Texas Ethics Commission has published “Form 1295” disclosures on its website. The Texas Tribune searched these filings and found that several state lawmakers were involved in almost 100 contracts with public entities. The number could be higher: Form 1295 filings are only required for contracts of at least $1 million, or those that require approval by the public entity’s governing body. State Rep. Eddie Lucio III, a Democrat from Brownsville who has done bond underwriting work involving Cameron County — where his district is located — told the Tribune that no client had ever asked him for political favors and said it was unfair to call that work a conflict of interest because Texas' citizen lawmakers need to work to earn money and their jobs can fall under a wide range of state laws. The state Constitution requires legislators to disclose any “personal or private interest” they have in bills that come before them, then recuse themselves from voting on those bills. But the Texas Government Code says that rule doesn’t apply if the benefit a legislator could get from a bill is the same as anyone else in their industry. However, the code also says state officers and employees “should not” engage in business activities that “could reasonably be expected to impair” their “independence of judgment” while performing official duties. The kicker is that the Ethics Commission can’t enforce this section of the code against lawmakers. If state employees violate these directives, they can be fired. But if legislators — who are elected by the voters — violate the same provisions, nothing happens. That’s because the commission has repeatedly ruled that it’s a matter of “personal ethics” for legislators to decide if their own outside employment is a conflict of interest. Craig McDonald, director of Texans for Public Justice, a liberal watchdog group, said West and Hernandez appear to be “doing special favors” for organizations in which they have a business interest. Hernandez’s law firm, Soto Hernandez, won a three-year spot in the HCC pool to provide legal advice in the area of “general education services” — although the firm doesn’t list education services as one of its practice areas. HCC’s Evaluation Committee ranked Soto Hernandez fifth out of eight “small” firms (and 17th out of all 20 firms) that competed to be in that section of the pool. In addition to sponsoring HB 254, Hernandez voted for three bills that HCC had identified as priorities: HB 1638, the bill that West sponsored in the Senate; Senate Bill 887, which mandated disclosure of certain loan information to students; and Senate Bill 2118, which allowed certain community or junior colleges to offer bachelor’s degrees in the “high-need” fields of nursing, applied science and applied technology. HCC did not respond to repeated requests for comment on this story. Hernandez told the Tribune she is new to running a law firm and is unsure about how the HCC legal services pool works. She could not say what providing “general education services” to HCC might entail. Meanwhile, West filed Senate Bills 2086 and 2122, which made it easier for community college students to transfer to four-year universities — a legislative priority for HCC. West helped vote both bills through committees before their progress stalled in the House. Like Hernandez, he also voted for several other bills that HCC supported. West said pushing legislation that could benefit a college that his law firm may do legal work for was not a conflict of interest, saying “the bills benefit most students in Texas.” He cited his voting record on ethics reform and said he believes in transparency. Two HCC trustees — Robert Glaser and Dave Wilson — voted against the motion that approved Soto Hernandez and West & Associates. Both said they were unaware that state legislators owned the firms they were voting on. Meanwhile, Wilson described a culture in which HCC trustees “walk by” the school’s procurement office — which negotiates the purchase of supplies, equipment and services for HCC — and “drop names” of companies they want to “suggest” for contracts. West is no stranger to conflict of interest controversies. He has raised eyebrows in the past for blending his fiscal interests as an attorney and his public duty to represent constituents. But Form 1295 disclosures shed new light on the extent of his controversial work in the bond underwriting business. Bond underwriting transactions are the most common way lawmakers benefit from contracts with public entities. West, Lucio and Reps. Joe Deshotel, D-Beaumont, Eric Johnson, D-Dallas, and Justin Rodriguez, D-San Antonio, have helped broker dozens of public bond issues in the past 18 months. Public entities such as cities, colleges, schools and transportation authorities raise money by selling bonds and hire firms to underwrite this debt. Underwriters effectively buy all the bonds, then profit by selling them to investors at a higher price. The five lawmakers usually acted as intermediaries in bond deals. This means a finance company paid them to negotiate directly with the public entity that wants to issue the bonds. West’s firm had at least 14 contracts with public entities, helping financiers such as Morgan Stanley, Wells Fargo and Raymond James broker agreements with Harris County and the cities of Beaumont and Houston. It also landed contracts on the other side of such agreements, working as bond counsel for the Dallas Area Rapid Transit Authority and Dallas ISD, which overlaps with West’s district. According to West’s personal financial statements, since 2008 he has earned between $25,000 and $200,000 from each of these public entities. West said he had practiced public finance law for many years before his election as Senator in 1992 and that his firm has two other attorneys that also handle bond business. He denied that his bond work was a conflict of interest. Rodriguez is a senior vice president at Siebert Cisneros Shank & Co., a financial company co-owned by former San Antonio Mayor Henry Cisneros. Siebert has listed Rodriguez’s involvement in 18 contracts with 13 public entities, including six in his district. One is the city of San Antonio, where Rodriguez previously served on the city council. Rodriguez said Siebert established most of these relationships through competitive processes before he joined the firm in March 2016. He said this didn’t present a conflict of interest and estimated Siebert makes $15,000 to $100,000 on each underwriting transaction. Johnson practices public finance law at Andrews Kurth, a Houston firm that last year ranked third in the nation for its number of municipal bond issues. Since last January, Johnson acted as legal counsel for six major investment houses, including Wells Fargo and Merrill Lynch, in negotiating 15 bond underwriting contracts with public entities such as Allen ISD, the city of Laredo, Dallas Area Rapid Transit and Dallas ISD. The latter two authorities overlap with Johnson’s district. Johnson sits on the House Investments and Financial Services Committee, which oversees public bond regulation. He told the Tribune that he attempted — unsuccessfully — to get House Speaker Joe Straus to keep him off the committee in order to avoid the perception of conflicts of interest. Deshotel, who is an attorney, last year helped four finance companies negotiate bond-underwriting contracts with Port Arthur ISD, which lies in Deshotel’s district. Deshotel serves on the House Public Education Committee. He says his role in these deals involved “standard stuff” like “reviewing documents” prepared by the underwriter’s lawyers and said he has no “special arrangement” with the school district. Deshotel estimated his total fees were “in the range” of $15,000. Deshotel added that he does little business with public entities. “If I do have a special advantage, then I’m doing a pretty bad job of exercising it,” he said. The filings list Lucio's law practice as a party to eight underwriting transactions between three finance companies and Cameron County — where Lucio's district is located. Lucio said that he received "nominal" payment from the underwriters' attorneys for "very simple" work such as processing documents and collecting signatures. Lucio added that he supports "responsible ethics reform" and he voted for the bill that created the Form 1295 disclosure requirements. This year, Capriglione authored another measure, House Bill 501, which requires legislators to disclose contracts with public authorities worth $10,000 or more — much lower than the current $1 million threshold. Lawmakers would also be required to report any work as bond lawyers for political subdivisions — a practice Abbott has called “unethical” and “particularly reprehensible” because the lawmakers are paid not by corporations but by taxpayers. Abbott signed the bill, which will take effect in 2019. However, under Texas law it will remain a question of “personal ethics” whether lawmakers who author bills that help their clients decide to recuse themselves from votes, committee hearings and other legislative activities that affect those clients. Without a stronger ethics law, the “appropriate” way for lawmakers to be disciplined for conflicts of interest involving their private business dealing is — according to a 1975 legal opinion from the Attorney General’s Office — for their colleagues in the Legislature to vote for their punishment or expulsion. In his view, it’s then “on the voters” to decide whether to act on that information. Disclosure: Houston Community College, Rice University, the University of Houston and Wells Fargo have been financial supporters of The Texas Tribune. A complete list of Tribune donors and sponsors is available here.